Greetings all, catching up on our blog, here's the latest ! 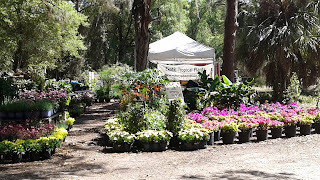 Fri/Sat/Sun April 5-7th, we will be at the Annual Spring Plant Show at Tropiflora Nursery in Sarasota. All of Tropiflora' stunning Bromeliads and Tillandsias will be on sale, plus there will other fellow plant vendor friends setting up, including us, with all of our specialties...Exotic Tropicals, Crotons and Ti Plants, Butterfly gardening plants, Ferns and , Cacti and Succulents and much much more. The event is free entrance and free parking. In addition, there is live music, food on-site, raffles and drawings and just loads of fun - bring your carts and have a great time at this Spring Festival. Quick details - the event runs Friday and Saturday, 8am-5 pm, and Sunday from 10am-4pm. Rain or shine ! Also,. this coming weekend, Mitch and our crew will also be at the annual Spring Garden Fest at Winter Garden Florida on Sat/Sun, April 6th and 7th. This event is a great one, widely attended, located in beautiful downtown historic Winter Garden. With over 150 vendors, you are sure to find something for your homes and gardens. There is also live music, tons of great music and its just a cool community happening. The show runs Sat/Sun from 9am-5pm - Free entrance and free parking around the area. The following 2 weekends - Sat. April 13 & 20th, we will back at Saturday Morning Market, downtown St. Pete. And the last weekend of April, Sat-Sunday, April 27 & 28th, its the Big mama of all local plant shows, the Green Thumb Festival, in St. Pete, at Walter Fuller Park, so mark your calenders ! !